Yale University won the 2014 Gill Coed Dinghy National Championship, hosted by St. Mary’s College of Maryland in St. Mary’s City, MD June 3 – 6. With a final score of 121 points, Yale finished 88 points ahead of second place Georgetown University. The Bulldogs were awarded the Henry A. Morss Memorial Trophy. The Georgetown Hoyas finished 45 points ahead of third place Boston College, winning the Oxford University Trophy for the second year in a row. The BC Eagles claimed the Metropolitan Sailing League Trophy. The Gill Coed Dinghy National Championship was the second of the 2014 Inter-Collegiate Sailing Association (ICSA) National Championship regattas won by Yale, who were also victorious in the APS Team Race Championship, sailed May 31- June 2 at St. Mary’s. 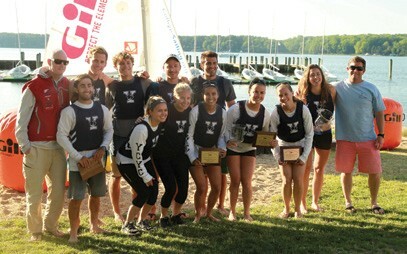 Yale finished in second place at the Sperry Top-Sider Women’s Nationals, hosted by the U.S. Naval Academy in Annapolis, MD on May 29 & 30, five points behind Dartmouth College’s Big Green. Full results are posted at 2014nationals.collegesailing.org. The ICSA is the governing authority for sailing competition at colleges and universities throughout the United States and in some parts of Canada. Visit collegesailing.org to learn more. Jen Vandemoer Mitchell contributed to this report.